Moving in Houston can be a challenge in and of itself. But when you add in pets… especially the typically sensitive felines, it could be a nightmare. But, fear not. When it comes to moving with cats, preparation is your best friend. It’s a common saying among cat people that you don’t own your cat. Instead, they kind of own you. You are their one and only for life. Since you’re reading this, we assume you’re lucky enough to already have this relationship. So, you and your kitty are moving in Houston. Let’s find out how to make that kitty love its new home. 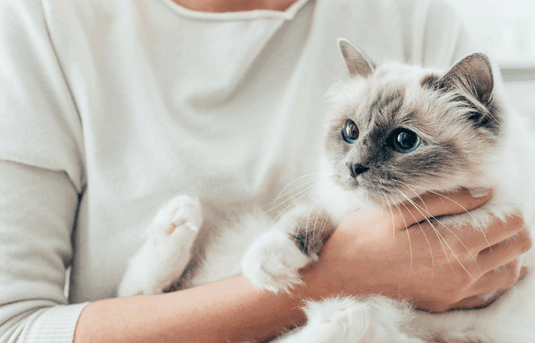 To make the transition easier for your kitty, there are a few key preparations you should consider. Here’s an infographic for all of our tips on making your move with pets a breeze. Cats are notorious for being easily stressed. Moving uproots everything they know. It rocks their world and you have the power to smooth the way for them. Don’t forget a list for your cat — their needs are a little different from your own. Let’s get you started. Get your cat used to traveling short distances in her crate. Pet-proof your new home in advance, if possible. Establish a routine and stick with it before and after your move. Discuss the possibility of anti-anxiety medications with your vet. Make sure you have copies of all important records. Ensure that her vaccinations are up to date. On the day of your move, you can keep your cat safe and happy by sticking to a few simple guidelines. Feed your cat a small meal the morning of the move to ease his stomach. Ensure he’s wearing his collar and identification. Keep him confined to one room while movers are coming and going. Safely secure his crate and do not open it while you are en route. When you arrive, limit him to one specific room at first. Consult with a vet if you notice signs of dehydration. Pet owners who will be flying have several more hurdles to cross. It’s critical that you check with your specific airline about carriers, vaccinations, travel documents, etc. Keep your vet informed and pay attention to every detail as you make your travel preparations. As you can see, moving cats requires a few extra steps to ensure that they adjust well to their new surroundings. But with a little preparation and attention to detail, kitty will be a happy roommate in no time. And we think your furry sidekick’s peace of mind is well worth the effort. The movers at Ameritex have helped cat owners through countless moves. Our specialty is taking the stress out of moving, for both our human clients and their furry companions. For more information, contact us for a complimentary moving quote.